Andrew Gillum, the Democratic candidate for Florida governor, speaks Friday during a campaign rally in Orlando. The robocall message, obtained by NPR, is narrated by someone pretending to be Gillum. The narrator uses an exaggerated minstrel dialect — featuring phrases like "We Negros" — with jungle noises in the background. The calls end with a disclaimer that they were paid for by The Road to Power, a neo-Nazi, anti-Semitic podcast operated by Scott Rhodes of Idaho. In Florida, robocalls supporting or opposing non-federal candidates or ballot proposals need a financial disclaimer — as well as a registered agent in the state, which the Idaho-based calls may not be able to prove. The FCC also says that robocalls must "state clearly the identity of the business, individual, or other entity that is responsible for initiating the call" at the beginning of each message — rather than impersonate someone. The same group is linked to robocalls sent out last week that used the death of Mollie Tibbetts to promote white supremacist messages, according to the Iowa Starting Line. Tibbetts, a University of Iowa student, disappeared on a run in July. Her body was discovered more than a month later. The suspect in her killing is an undocumented immigrant from Mexico. The Starting Line reports the call said, "If after her life has now been brutally stolen from her, she could be brought back to life for just one moment and asked, 'What do you think now?' Mollie Tibbetts would say, 'Kill them all.' "
Tibbetts' father Rob Tibbetts wrote an op-ed in the Des Moines Register on Saturday, decrying the right-wing punditry around his daughter's death. "Do not appropriate Mollie's soul in advancing views she believed were profoundly racist," he wrote. The same podcast has also been linked to robocall campaigns in Charlottesville, Va., Oregon and California, according to Right Wing Watch. The Tallahassee Democrat reports that calls have previously used "the local area code and prefix followed by a four-digit number associated with neo-Nazi rhetoric." Over a billion robocalls head to landlines and cellphones every month, reports Planet Money. Many of them appear to be from a line that has the recipient's same area code — but are really scammers or spammers "spoofing" their real number using the Internet. Experts tell NPR that it costs around 1 to 5 cents per call. Last week, GOP Florida gubernatorial nominee Ron DeSantis was criticized for comments some said amounted to racist dog whistling. "Let's build off the success of Gov. Scott. The last thing we need to do is to monkey this up by trying to embrace a socialist agenda," DeSantis said. A spokesperson for the candidate later said the comments were not racially charged. Gillum told CNN he "will continue to focus solely on the issues that Floridians care about and uniting our state." A spokesperson for DeSantis said the calls were "absolutely appalling and disgusting." "What I don't want the race to turn into is a race of name calling," Gillum continued. "I want to make sure that we don't racialize and, frankly, weaponize race as a part of the process, which is why I have called on my opponent to really work to rise above some of these things." The Florida gubernatorial election has started out with issues of race at the center. The morning after the primary last week, Republican nominee Ron DeSantis told voters not to monkey up the state by electing his Democratic opponent Andrew Gillum, who's African-American. DeSantis denied his comment was racist. 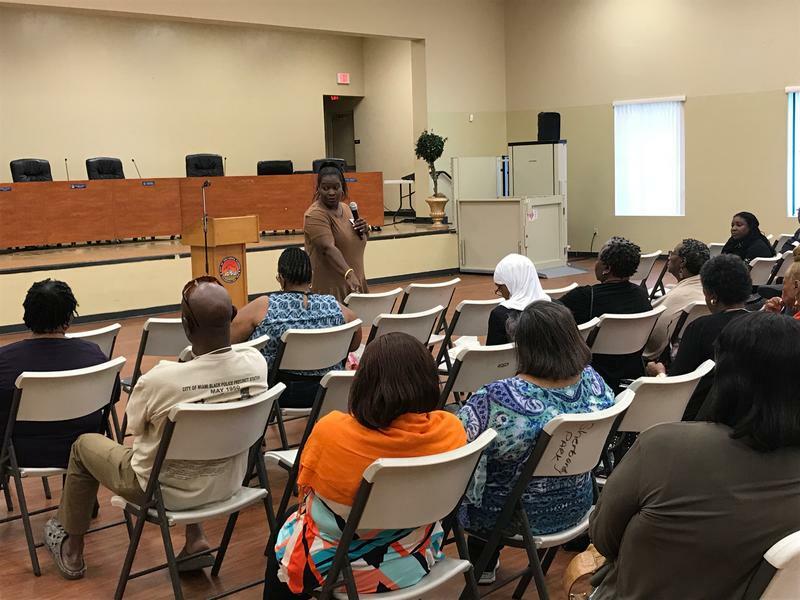 Later in the week, racist robocalls impersonating Gillum went out to some Florida voters. NPR's Emily Sullivan has more. 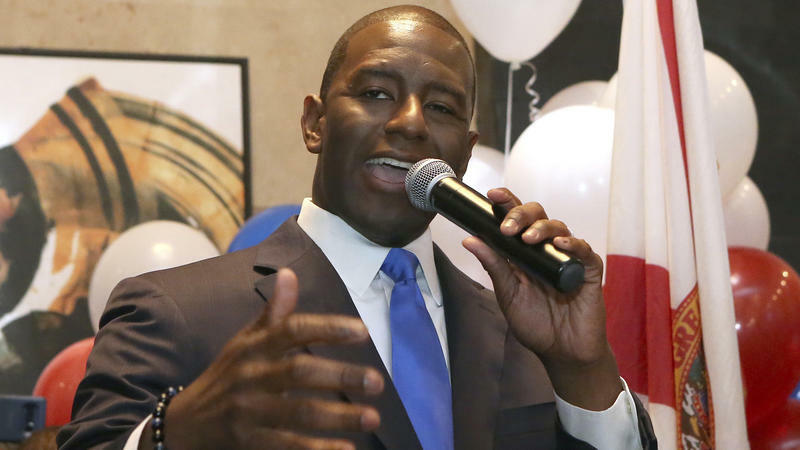 EMILY SULLIVAN, BYLINE: Tallahassee Mayor Andrew Gillum is the first African-American to win a major party's nomination for Florida governor. The 39-year-old progressive defeated centrist Democrats in an upset in last week's primary. NPR obtained a recording of a robocall targeting Florida voters in the race for governor. A narrator claiming to be the candidate speaks in an exaggerated dialect straight out of Jim Crow with background sound evoking the jungle. The brief excerpt you're about to hear is overtly racist. UNIDENTIFIED PERSON: Well, hello there. I is Andrew Gillum, and I be the mayor of Tallahassee. SULLIVAN: Again, that overtly racist clip is an impersonation. The call ends noting it was paid for by The Road to Power, a neo-Nazi, white supremacist podcast operated by an Idaho man. The Road to Power also sent robocalls to Iowa last week, using the death of Mollie Tibbetts to try to spread a racist, white supremacist message. Tibbetts, a University of Iowa student, disappeared on a run in July. Her body was discovered over a month later. The suspect in her killing is a Mexican immigrant who entered the U.S. illegally. The Iowa robocall, in part, suggested that if Tibbetts were alive today, she'd advocate for the killing of all Mexican immigrants. Her father, Rob Tibbetts, wrote an op-ed in an Iowa newspaper on Saturday decrying the political furor around his daughter's death. He said, quote, "do not appropriate Mollie's soul in advancing views she believed were profoundly racist." More than a billion robocalls head to landlines and cellphones every month. An executive in the robocall industry tells NPR it costs just around 1 to 5 cents per call placed. ANDREW GILLUM: What I don't want this race to turn into is a race of name-calling. I want to make sure that we don't racialize and, frankly, weaponize race as a part of this process. SULLIVAN: Gillum says he'll continue to focus on his campaign. Emily Sullivan, NPR News. Transcript provided by NPR, Copyright NPR. Andrew Gillum was expected by many to be an also-ran in Florida's Democratic gubernatorial primary. 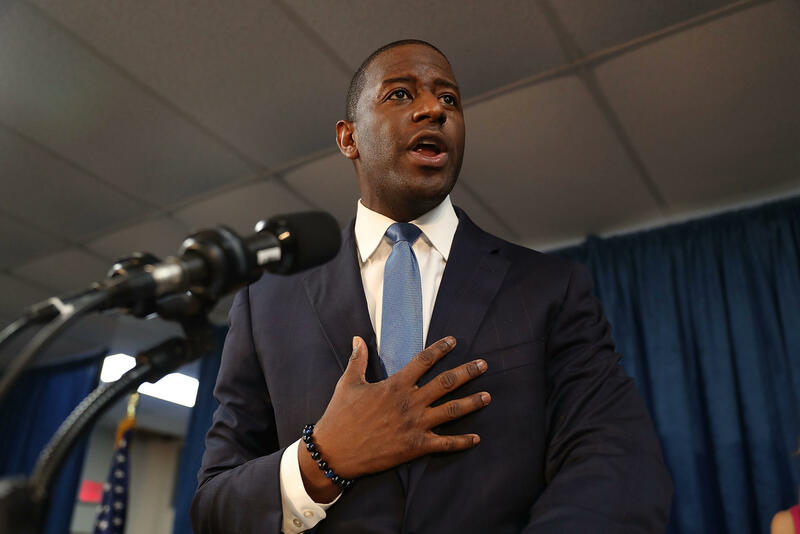 Now, despite being heavily outspent by his better-known centrist rivals, the 39-year-old Tallahassee mayor is his party's nominee, and has already drawn attention from the Oval Office. In addition, only hours into the general election, Gillum's Republican opponent is being criticized for making what some are calling racist remarks, telling Florida not to "monkey this up" by electing Gillum.